At this year’s APEX we thought it would be interesting to watch out for the following as examples of potential show announcements: consolidations; large companies seeking smaller companies and ancillary products; and even passenger apps that help expand business, save money and allow for personalized customer experiences. And without saying, there will be more industry changes to write about in the coming weeks. True to form, this week’s Hot Topic primarily pertains Astronics, a big player that is getting even bigger. With recent acquisitions, Astronics is expanding and diversifying within the aviation realm. We were fortunate enough to have some questions answered by Executive Vice President, Mark Peabody and several other company Division Presidents. 1. Mark, could you please provide us with a broad statement on company updates: number of subsidiaries, number of employees, locations, and a broad product focus to set the stage? Astronics serves the world’s aerospace, defense, and semiconductor industries with innovative power, lighting, connectivity, interiors, structures, and service solutions. Comprised of 11 subsidiaries, the Company employs nearly 3,000 team members in locations around the globe. 2. How many of the Astronics’ subsidiaries deal with data and connectivity for the aviation industry and who are they? Astronics CCC and PGA often cooperate on providing solutions together for the VIP/BizAv markets. For the purposes of this article, we will include information from Astronics Ballard Technology, Astronics AeroSat, and Astronics CSC, where their product lines serve the needs of commercial transport. 3. What specific products/systems (antennas, WAPs, servers, data storage, etc.) does Astronics currently manufacture via their subsidiaries? Aircraft Data Systems – New smart sensing systems, aircraft interface devices, avionics I/O computers, avionics test & simulation interfaces, and other data and connectivity related products. 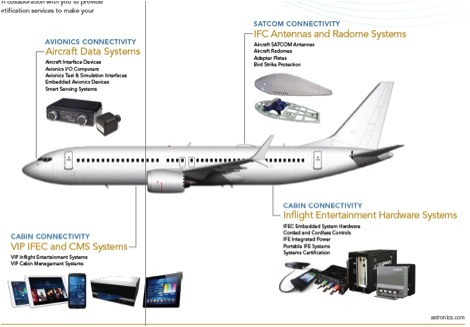 Inflight Entertainment Hardware Systems – Cabin wireless access points, IFE content loaders and servers, modem managers, custom IFEC LRUs, corded and cordless control units, and systems certification services. IFC Antennas and Radome Systems – Complete connectivity system solutions including Aircraft SATCOM Ku-band antenna systems, aircraft radomes, adapter plates, and other necessary system components. Here is a link that outlines our offerings. Power to Support IFE. In addition, we support inflight entertainment and connectivity for the airlines with integrated IFE seatback power systems. We also support the passengers in a BYOD environment by providing in-seat power systems to keep their devices charged while consuming content. 4.What features and benefits do the data and connectivity products from Astronics have over the competition? 5. Broadly speaking, how many aircraft have this type of your equipment installed today? We have some systems with large installed bases, and some that are new to the market. Some of our product lines are on a few hundred aircraft, and in other connectivity product lines, we estimate that we supply about 85% of long haul aircraft. The numbers of installations, and the numbers of systems per aircraft, are not always reported back to us. In general, we estimate that Astronics connectivity and data solutions are in service on thousands of commercial aircraft worldwide. 6. We asked Mark what types of data and connectivity are provided. Specifically, is Astronics providing any other types of data connectivity besides passenger related – if any? Flight data, computational analysis, AI? And how is it used: on the aircraft, on the ground, both? Here are the inputs from three of our various Division Presidents. 7. Let us now continue with Mark: As a result of these company acquisitions that can deliver complete IFE systems, has this caused Astronics to rethink what and how you sell? In other words, some of the newer subsidiary acquisitions never sold directly to the airline, instead they were suppliers to other IFEC vendors. Is there a new strategy now? Along the same lines, historically when we have visited the Astronics booth at a trade show we would see various ‘boxes’ that help comprise an IFE system. Can we now expect to see an “Astronics IFE System(s)” in the near future? Astronics intends to remain system agnostic and primarily support our partners in creating complete IFE systems. Our solutions enable global airlines, inflight connectivity providers, systems integrators, and airframe manufacturers to create seamless connectivity experiences. 8. Was there a future company strategy involved in the acquisition of companies involved in data, data analysis, data transmission/acquisition or did acquisitions happen more based on dollars and/or complimentary diversification to the existing business model? Astronics looks opportunistically at companies that are available to acquire and certainly considers long-term strategy as part of our decision to move forward. 9. In the past, Astronics has been a data communicator. Do you see a future whereby Astronics is going to be a data analyzer? In other words, historically Astronics data efforts have been directed more toward passenger data. Do you see Astronics adding more data sources and considering data analysis? Furthermore, since around 1990, aviation has seen an increasing value of, and usage of data, to-and-from the aircraft. As technologies like Artificial Intelligence and massive data analysis have provided better analytical information of things like engines and onboard computers, the use of data both to-and-from the airplane is helping things like maintenance, failure prediction and longer operational usage. Thus, data is becoming a very new and important part of aircraft operations, fault isolation and monitoring. Add this to an increase of passenger usage of data to-and-from the plane will be another part of data growth. The only question is will the airplane use one or multiple data systems and connectivity to deliver the data to the ground? While passenger data has been primarily (we guess) Astronics connectivity reason, we were wondering if this new data avenue is part of your future data goals? 10. One or more of your recent subsidiary acquisitions have established manufacturing business relationships with China and Astronics has successfully marketed the EmPower product line to Chinese airlines over the years. As an industry leader with this much experience in the PRC, how do you see the recent trade disagreements between the USA and Chine affecting the IFEC industry as a whole? Business climates can suddenly change. Trade disagreements can affect our industry, and we focus on ensuring our business offers a balanced global reach so that we can absorb the ebb and flow of these issues. 11. What will Astronics be showing at APEX in Boston? At this year’s APEX Expo, Astronics will display a variety of power and connectivity solutions that improve passenger experiences and aircraft operational efficiencies. 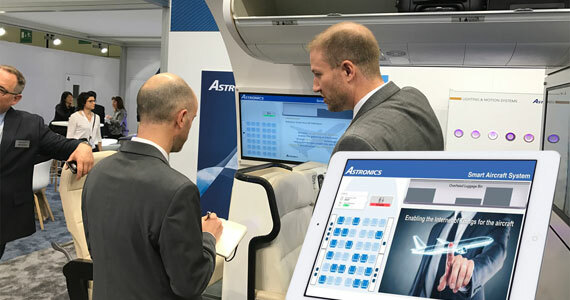 For seamless passenger and crew connectivity, Astronics will demonstrate a newly certified FliteStream inflight connectivity system hardware plus their Summit Line inflight entertainment system hardware. In power solutions, Astronics will present a breadth of new EmPower in-cabin products for use by passengers and crew, including a new wireless charging module and a new USB Type-C passenger power system. The Astronics SmartTray passenger PED holder will round out the offerings. During the show, booth visitors who tweet a photo from the Astronics booth with the tag @AstronicsCorp and the hashtag #APEXexpo will be entered to win an iPad with an Apple store gift card to enjoy IFE content on the way home. View all of these solutions and enter to win in the Astronics booth, #343. For additional information on Astronics power and connectivity solutions, visit Astronics.com. Astronics also plans to demonstrate some brand new technologies, including an intelligent bin sensing solution, which provides bin capacity and other bin data to crews for increased safety, faster passenger boarding times, and improved operational efficiencies. The other new technology Astronics will feature is an exploration of Li-Fi, and ideas for harnessing it for use on aircraft. Li-Fi leverages light to send information, in contrast to Wi-Fi, which uses radio waves. Proven capable of transferring unprecedented data at several Gigabits per second, Li-Fi could eventually empower passengers to download an HD video in just a few seconds, for example. Inmarsat and Panasonic Avionics Corporation (Panasonic) have agreed a strategic collaboration, for an initial ten-year period, that enables them to combine their highly complementary market leading services to offer broadband in-flight connectivity (“IFC”) paired with high-value solutions and services to customers in the commercial aviation industry worldwide. This collaboration will enable airlines, aircraft manufacturers and passengers to benefit from the combined expertise of two companies that have been at the forefront of technology and innovation for nearly four decades. Under the terms of the agreement, Inmarsat will become Panasonic’s exclusive provider of Ka-band IFC for commercial aviation. Panasonic will now be able to offer Inmarsat’s high-speed, broadband connectivity service, GX Aviation, powered by Global Xpress, the world’s first global Ka-band satellite network, owned and managed by a single operator. Panasonic will continue to invest in its own network and, with GX Aviation as a primary offering for new business, will be perfectly positioned to serve both its current and future customers. In addition, Inmarsat will now be able to offer Panasonic’s market-leading portfolio of services and NEXT solutions to Inmarsat’s commercial aviation customers. This includes customer support services available from Panasonic’s Customer Performance Center and Technical Services teams. The collaboration, which is already being deployed with a mutual customer, presents a unique opportunity to leverage Inmarsat’s proven track record of high-quality and innovative global mobile connectivity, and Panasonic’s market-leading in-flight entertainment, digital services and connectivity solutions. Looking forward, Inmarsat and Panasonic will also collaborate on the development of a next generation GX Aviation terminal, as well as new connectivity-enabled services, data analytics and technology to improve overall end-to-end performance. By delivering this step-change in aviation services capability, airlines will have access to new and better solutions that address widely recognized industry challenges of capacity, coverage and compatibility. This will give greater quality, consistency of experience and more choice to airlines and their passengers in the IFC market, which by some estimates could exceed $100 billion by 2035.